Silk fabric differs in thickness and weave. According to the website Silk Painting Gallery, in the article "How Silk is Made", silk is a natural fiber harvested from the cocoons of silk worms. Because of its delicate nature, silk degrades when exposed to chemicals and acidity; and shreds and deteriorates over time and with exposure to light. Holes or tears in silk may be repaired with fusible fabrics or patched with silk, but repairs are rarely invisible. Discolored or yellowed silks can be treated with vinegar. Repairing silk is a challenging task. Measure the rip or hole with a ruler and cut a piece of one-sided fusible fabric ½ inch longer and wider than the rip/hole. Fusible fabrics are sold at craft and fabric stores. Purchase the thinnest fusible fabric possible. 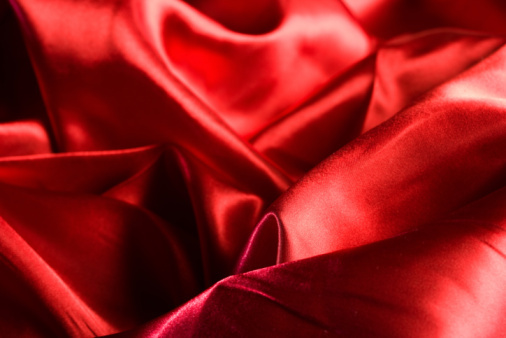 Most silk is thin and fusible fabric will be detectable under the silk. Use embroidery or finger nail scissors to snip away any jagged edges to the rip/hole. Turn the item inside out. Arrange the silk on the ironing board so the wrong side of the garment or fabric is facing you. Pull the edges of the rip/hole as close together as possible without bunching or puckering the fabric. Set the iron on a silk setting. Place a pressing cloth or thin dishtowel over the rip/hole and press the edges of the rip/hole flat. Remove the cloth. Center the fusible fabric patch over the hole/rip with the fusible, adhesive side touching the fabric. Spray the pressing cloth with water. Place the damp cloth on top of the fusible fabric patch. Press the iron onto the cloth, onto the fusible patch, over the hole/rip in the silk. The pressing cloth eliminates scorching of the delicate silk. Hold the iron over the cloth and patch for the fusible fabric manufacturer's recommended amount of time. Remove the cloth. Turn the garment or fabric right side out. According to How to Clean Stuff website, in the article, "How to Wash Silk", when caring for silk on a routine basis, avoid ironing if possible, but if you must iron silk, always use a pressing cloth. Measure the rip or hole. Use similar silk fabric or fabric cut from an inside seam or hem of the same garment to cut a triangular patch ½ inch longer and wider than the rip/hole. According to the Chest of Book website, in the article, "The Darning of Silk", a three-sided patch is neat and covers rips and holes well. A patch from like or the same silk is also good for covering spots of rotten or brittle fabric. Trim the jagged edges of the rip or hole with embroidery scissors. Lay the silk on a flat surface with the right side of the silk facing you. Thread a needle with one-ply silk thread in as close a color match as you can manage. Tie a knot at the end of the thread. Place the triangle patch over the rip/hole with the triangle bottom running in the same direction as the fabric's grain. Fold one patch edge under. Pin. Fold the other two edges under and pin. According to the Chest of Book website, in the article, "The Darning of Silk", sew the three patch sides onto the silk using a very tiny running stitch and sewing as close to the patch edges as possible. Move the needle in toward the patch center ¼ inch and sew a second row of stitches, in the shape of the triangle along the edges using a running stitch. Turn the silk inside out. Lay the patched rip/hole onto a flat surface. Sew the jagged edges of the hole/rip on the inside of the patch using an over-sewing stitch or whipstitch. Be careful not to snag the patch fabric beneath. Cover the patch with a pressing cloth. Press with an iron set on a silk setting. Place the silk in a container. Fill the container with cold water. Add the manufacturer's recommended amount of detergent for delicates. Wash the silk gently using a kneading motion. Loosely squeeze the silk in the water. Rinse the fabric in a sink in cool water until all detergent residue is removed. Refill the container with cold water. Add ½ cup vinegar. Immerse the silk in the vinegar solution. Rinse the silk in the sink with cold water. According to How to Clean Stuff website, vinegar prevents the yellowing of silk. Never bleach silk. Bleach destroys silk fibers. Lay a towel onto a flat surface. Place the silk as flat as possible on top of the towel. According to How to Clean Stuff website, roll the silk in the towel, gently pressing the moisture from the silk fabric. Never twist silk. Hang the silk to dry over a shower curtain rod.